Recently I asked a good friend, a solid Christian, if this chapter means that all leaders are put in leadership by God and that we should submit to them. "Yes," he proclaimed without hesitation. "So Hitler was put in place by God?" "Absolutely" he stated firmly. "God said it and I believe it. " Case closed. Is it really? Romans 13 is the most discussed and debated chapter in the Bible. One Bible class I taught centered on this particular chapter, which provoked passionate discussion. 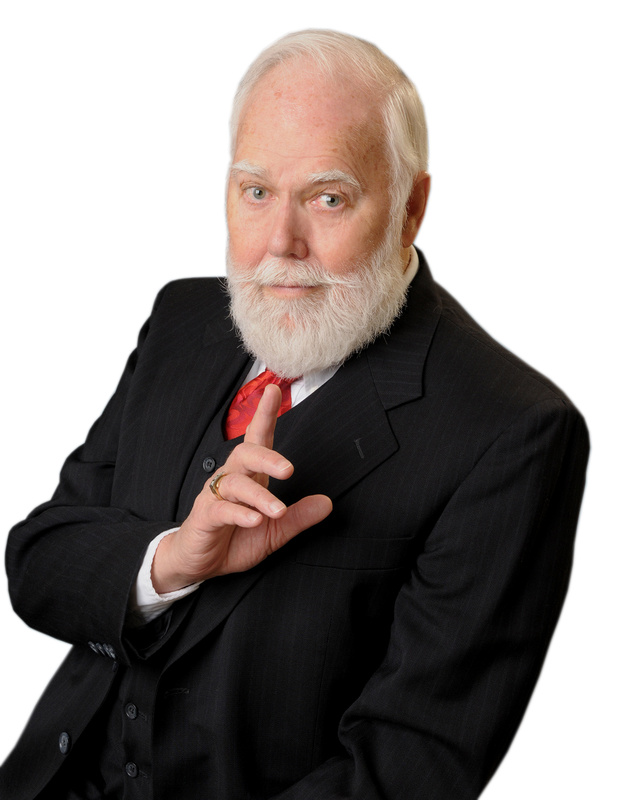 However, the general consensus was "Well, after all, it IS in the Bible." This utterance seeded additional thoughts: How can this be? For me, something about this chapter was and is wrong and simply did not add up, considering other biblical passages that would refute this idea. This book answers all these questions. Chuck Baldwin, a highly regarded minister and columnist, along with his son, Timothy Baldwin, a prominent attorney, have also been intrigued by this and did an in-depth study of this perplexing chapter. They also researched biblical instructions regarding government. 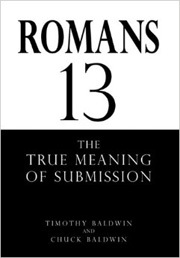 With Chuck being a theologian who can analyze Holy Scriptures, and his son Timothy being a skilled attorney who can examine facts thoroughly to complete his brief, this father and son team published their excellent book," Romans 13 – The True Meaning of Submission." This is the go-to book for serious Christians seeking honest answers. Opening the book, I immediately went to the fourth chapter (pg.41) titled," That God Commands Unlimited Submission to Unjust Government Contradicts God's Nature." On the next page, the issue is nailed down: "A sure sign of one who is not a minister of God is a covenant breaker. God's ordinations stand in sharp contrast to those who operate by such rules of inconvenience and lies. God's ordaining such covenant breakers would make God unworthy to judge the world. "That God would use the ministers of Satan and the unjust laws of man (calling evil good and good evil and doing what is right in their own eyes) to blind mankind into unconditional submission of those evils so that man may know the justness of God and man's need of a Savior would be peculiar indeed." Especially valuable is that all of these conclusions stated by the writers are backed up with scriptures that are referenced in a very generous section of notes. Everything they write is backed up by the Bible. "People with reprobate minds easily violate the natural laws of God and the rights He has commonly given to mankind. Most certainly, people qualifying as such who hold positions in government will destroy that society, including the most innocent within." Read this carefully, as it shows us clearly who is currently occupying the White House. It certainly was NOT God who put him in that position. Another profound statement is this on page 37: "There are some who would suggest that God's standards for Christians of the New Testament are different than His standards for people in the Old Testament. Is that true? Is the God of the Old Testament a God of justice and the God of the New Testament a God of injustice?" These questions are all sorted out and cleared up. All Christians, pastors especially, should have this book in their library. We are instructed in 1 Peter 3:15: "Be ready always to give an answer to every man that asketh you...."
Questions about this chapter WILL come up from time to time. As the late Paul Harvey would say: "And now, the REST of the story." In an independent study of the history of the King James Version of the Bible, I found this: The king brought an odd assortment of ne'er-do-wells to translate this version. In that group was an out-of-work writer, an unsuccessful painter who was broke, a poet who never took a sober breath in his life, one sexually confused, all of them misfits. King James instructed them thusly: "Translate the Bible as accurately as possible...except those passages that could get me in trouble politically," There it is. And thus Romans 13 was birthed in its present form. How I would like to be able to read that original chapter in Greek. Something puzzled me in earlier years as I read the Bible. There is a consistent flow and style in those writings, except Romans 13. It is very, very subtle, but that inconsistency is there nonetheless. That chapter was obviously transformed to encourage subjects to obey the King's commands without question. Otherwise, that chapter could indeed put him in trouble politically. FINAL NOTE: The text we now have is from the original Tyndale Bible, not the work of the translators. So the beautiful wording came from Tyndale, not from the "translators" hired by King James...except for Romans 13.
chuckbaldwinlive.com. Doesn't matter where you get it, just get it.